Composer birthday celebrations are an unavoidable trope of concert programming. Even when the composer is a living one, the urge to revisit works in an anniversary is an irresistible temptation for too many arts organizations. 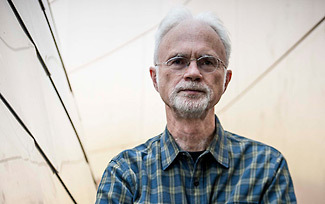 But when the composer is John Adams, celebrating his 70th year, and the ensemble is the Los Angeles Master Chorale, objections fade in the wake of some great music performed under optimal circumstances. LAMC Artistic Director Grant Gershon and his vocal artists are no strangers to Adams’ music and have a working relationship reaching back for decades. In fact, later this year Gershon will lead the world premiere of Adams’ latest opera, Girls of the Golden West for San Francisco Opera. So a program honoring Adams last Sunday may be expected but this evening had a decided twist. The first half of the night was devoted to choruses from Adams’ operas and oratorios. The beauty and complexity of these choruses is perhaps the best kept open secret of Adams’ oeuvre. Not to LAMC listeners, though, who have heard the four profound and richly textured ensembles from The Death of Klinghoffer in prior concerts here. They were again beautifully rendered in new piano transcriptions that Gershon had prepared for Adams’ publisher, which he noted should be out later this year. Joining the Klinghoffer sections were choruses from The Gospel According to the Other Mary, A Flowering Tree, and Doctor Atomic. Perhaps most ecstatic of these performances, though, was the toast chorus from Nixon in China. Close on the heels of the masterful LA Philharmonic performances of this opera last month, this closer for the first part of the evening left no doubt about Adams’ enduring musical legacy regardless of what yet lays ahead. In the second half of the evening, Gershon and the Chorale diverged from the standard tribute show blueprint by instead presenting a work not composed by Adams but one of his own favorite composers. Starvinsky’s Les Noces was a perfect counterpoint and suggested much about what Adams has built his entire artistic career on. Les Noces continues to sound as bold now as it likely ever has, and the Chorale with soloists Elissa Johnston, Todd Strange, Nicholas Brownlee, and Niké St. Clair emphasized the rhythmic folk music elements of the piece tapping in to the dramatic and narrative elements of the work. Like everything else that night, it was jubilant and fittingly so for the composer who has been a friend to so many here in his native California.